In the fall of 2004, I arrived in Azerbaijan on a two-year quest to learn about the musical epic-telling art form known as "Ashug" [alternative spelling "ashig" and "ashuk"]. I was on a Fulbright grant, doing research for my dissertation at the University of Wisconsin. Upon arriving in Baku, I tried to meet all of the Azerbaijani scholars who had published about this art form. I was especially keen to interview Amina Eldarova whose book, "The Art of the Azerbaijani Ashug" (Baku: 1984), was the only work that had been available to me in the United States. Amina had been a graduate student of the composer Uzeyir Hajibeyov (1985-1948) and had become Azerbaijan's first female musicologist and first ethno-musicologist. When I contacted her, she graciously invited me to her home. After learning that I was from the United States, Amina became intrigued. "You know, I once met another American who was interested in ashug music. It was in 1964 at a conference in Moscow. A young man was there by the name of Alan Lomax. Do you happen to know him? Congress even includes Azerbaijani ashug music. I was very surprised. How had folklorist Alan Lomax (1915-2002) - famous for his extensive archives of folk music from rural America - traveled to a conference in the USSR at the height of the Cold War? And with all the thousands of music samples he must have heard, how had he happened to chance upon music by Azerbaijani ashugs? I asked Amina to tell me more. Her memories of the occasion were warm and detailed. "It was August 1964," she went on. "I was attending the Seventh International Congress of Anthropological and Ethnographic Science in Moscow where I presented a paper. I took Akbar Jafarov and Museyib Abbasov with me. Akbar was an ashug performer and Museyib accompanied him on the "balaban" - a double-reed wooden, wind instrument - while Akbar sang and played a long-necked lute called "saz". They performed together at the conference. Ashug Akbar had a voice as sweet as honey. No one had a voice like his," Amina continued. "Alan Lomax liked my paper very much, and he wanted to record Ashug Akbar. But at that time," she continued, "we were on very bad terms with America, and authorities wouldn't allow us to talk very much with Americans. To get the permission that Lomax wanted, I knew we would have to go through a lot of bureaucracy and paper work. Fortunately, Lomax was prepared and when Akbar and Museyib performed for him, the great ethnographer made recordings himself on his own tape recorder." Amina Khanim ["khanim" is an endearing term of respect in Azeri for a woman] also told me how several months later Alan Lomax had sent her a set of phonograph records, which were his own recordings of American folk music. "At that time we had so little contact with America. To tell you the truth," she admitted, "when I received the package, I was too scared to open it! So I turned it over to the Partkom (Communist Party Committee) and didn't even take the records home with me. In fact, I never got the chance to hear them. But I still have this" and she showed me the postal order with Lomax's signature and his return address in New York City. She had treasured it for 40 years. "I suppose he has written a lot of books by now - is he a professor?" she asked. I told her that Lomax had gone on to write books and articles but that he had died a few years ago. Alan Lomax was one of the most important folklore and music collectors that America has ever known. At the age of 18, he started working with his father John Lomax (1867-1948) to record folk songs of rural America for the Library of Congress. Alan Lomax ended up devoting his entire life collecting music and oral history from all over the country. Later, he presided over the Archives of American Folk Song at the Library of Congress, producing numerous radio and television shows about folk culture. This, in turn, played a crucial role to inspire the folk revival of the 1960s. It was Lomax who helped launch the careers of brilliant Blues singers such as Jelly Roll Morton, Leadbelly, Muddy Waters and many others. Lomax was a political activist who championed the rights of minorities and the poor. He subsequently was blacklisted during the anti-communist McCarthy Era in the 1950s. He also gathered recordings of folk music from Great Britain, the Caribbean, Italy and Spain. He also founded the Association for Cultural Equity - convinced that music of all cultures of the world should be recorded and made available to the public. In 1993, his book "Land Where the Blues Began" won the U.S. National Book Critics' Award. In 1986, Lomax was awarded the National Medal of the Arts by President Ronald Reagan for his contributions to American culture. Lomax had attended Harvard and Columbia universities, and in 2001 Tulane University in New Orleans gave him an Honorary Doctorate of Philosophy. In 2002 the National Academy of Recording Arts honored him with a Grammy for his Life-Long Contribution to American Music. His recordings, collected over 70 years, are now housed in the Library of Congress American Folklife Center, the country's largest national archive [See www.loc.gov/folklife/lomax]. Because Lomax was of such enormous stature, I was amazed to find a link to him nearly half a world away, almost half a century later through Amina Eldarova, who was a pioneering musicologist herself. I promised myself that I would try to find the recordings that Lomax had made in Moscow and bring them to her. Much to my amazement, the recordings found me before I even got the chance to start searching for them. In 2005, ethnomusicologist Theodore Levin traveled to Baku to work on a series of recordings for Smithsonian Folkways. When we met to discuss Azerbaijani music, he handed me a CD, explaining that it was a recording of Azerbaijani music from the Alan Lomax Archive. Levin wondered if I could find out more about the songs that were included: Who were the singers and what was the meaning of the words? The first chance I got, I took the recordings to Amina's house. As I turned up the volume of the CD player, she listened intently and then turned to me in amazement. "Can it be?" she marveled. And then she confirmed that, indeed, they were the exact recordings from Moscow. In fact, even her voice is heard on the recordings, translating Lomax's questions from English into Azerbaijani. 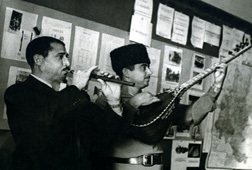 Above left: Museyib Abbasov (playing balaban) and Ashug Akbar Jafarov (playing saz) in Moscow, 1964. Lomax recorded their music and included it in his collection of World Music, which is now archived in the U.S. Library of Congress. 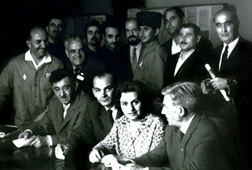 Above right: Amina Eldarova (seated) with other scholars at the 1964 conference in Moscow. Ashug Akbar is wearing the Azerbaijani "papaq" hat. She explained to Lomax about the genre of ashug art. The recording includes three songs and Lomax is heard asking for a translation of the words of the songs and questioning about the music. But what seemed to impress him the most was Akbar Jafarov's singing. "Tell him that his voice is one of the most beautiful things I've ever heard in my life," Lomax tells the translator on the recording. "He has this very high sweet voice like I've never heard before. Ask him if that's the way that the best singers perform in Azerbaijan." "That's the way they sing; that's ashug art," Amina explains on the tape. "Not everyone can be an ashug." "I'd like to know who taught him to sing," Lomax asks. "My master was Ashug Gadir Ismayilov," Jafarov replies. "Ask him how the teacher taught him to sing in that voice," Lomax continues. "I don't know, he just did it," Ahmad replies, laughing. "I have one other question," Lomax continues. "Actually, it's kind of a silly question. But does Ahmad have a name for his guitar? Does he call it like: my little sheep, or my little horse, or my little apple.Sometimes performers have pet names for their musical instruments." When the question was translated, Ashug Akbar answers simply: "I just call it 'saz'." Lomax also listened to a balaban solo and interviewed Museyib Abbasov. He was interested in his "flute" technique. He was also curious about the musicians' professions, whether they were farmers. Referring to Museyib, he adds: "He probably didn't get those muscles playing the flute!" Museyib laughs and Amina explains that Akbar and Museyib had come from the countryside but that they were professional musicians now. Although the exchange is short, the recording illustrates how Lomax was looking for commonalities with other folk traditions in order to contextualize an encounter with a type of music that he had never heard before. The interview is a tribute to Alan Lomax's courage as a scholar, his great love for music, and his respect for musicians of all cultures. The recording is also a piece of Cold War history - a unique cross-cultural encounter, dating back to a time when the United States and the Soviet had icy relations and were distant and isolated from each other. I presented a copy of the CDs to the National Azerbaijan State Archive of Sound but I still hoped to give a copy to the artists themselves. In 2005 I traveled to the mountainous Tovuz region in northwestern Azerbaijan. Unfortunately, Akbar Jafarov had died in 1990, but people said that the balaban performer Museyib Abbasov still lived around there. Accompanied by Azerbaijani folklorist Sadnik Pashayev and Natasha Kipp, a Fulbright researcher studying the art of the balaban, I had brought a copy of the Lomax recordings and a tape player on which to play them. We asked around town and were guided straight to Museyib's house. By that time, he was already in his 70s. His family was surprised at our visit to their rural home. When I explained why we had come, he immediately recalled meeting Alan Lomax in 1964. When I played the tape and he heard Ashug Akbar singing, his eyes filled with tears. He told us how they had played together throughout Azerbaijan. As is traditional, Museyib had never played with any other ashug. Neighbors and friends, these two had played together for more than 30 years. Upon Ashug Akbar's death, Museyib never performed again. Watching Museyib listen to those 40-year-old recordings and launch into a flood of reminiscences just as Amina had, convinced me that these recordings really belonged to these Azerbaijanis more than anyone else. And I had a feeling that Alan Lomax - had he known - would have been mighty glad that after so many years I had been able to bring them back. Alan Lomax's career was so extensive that they say it's hard to find a place where he had not been. Renowned musicologist and folk song scholar Bruce Jackson wrote that even in the most out-of-the-way places, such as the mountains of rural Virginia, the musicians used to ask him if he knew "the other feller" who had been there before. "What other feller?" Jackson would wonder. "The one who had a machine like yours. He was here a while back. He was doing the same thing you're doing. His name was Lomax." [See "Remembering Alan Lomax" in Buffalo Report, July 26, 2002.] Little is known about the trip that Alan Lomax made to Moscow in 1964. Thus, imagine my amazement when I arrived in Azerbaijan myself and discovered that "the other feller" had already been here 40 years earlier! True, he had a big reel-to-reel tape recorder and I had a small electronic mini-disc. But, otherwise, he was, indeed, doing "the same thing" that I was doing - trying to bring people together through music. How his trip had taken place, how he had received permission, and what he had thought about his experiences are questions I'm hoping can be answered by searching his field journals. One thing is sure - despite the fact that Lomax had collected tens of thousands of folksongs - the voice of an Azerbaijani Ashug Akbar Jafarov was so unique that it made him observe: "Tell him that his voice is one of the most beautiful things I've ever heard in my life."